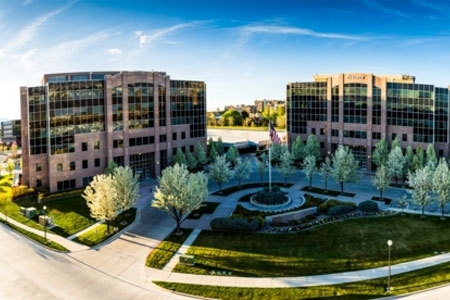 South Towne Corporate Center is one of the premier Class "A" suburban office projects in the Salt Lake City market. Completed in 2000 and 2006, the property is comprised of two best-in-class, six story office buildings, encompassing a total of 262,219 rentable square feet and situated on 10.7 acres. Southe Towne Corporate Center is strategically located within Salt Lake City's technology corridor - the "Silicon Slopes" - comprised largely of biotechnology, education, retail, and creative firms. This submarket is located 13 miles south of Downtown Salt Lake towards the southern end of the Salt Lake County. The properties feature dramatic two-story wood and stone-clad lobbies, efficient floor plates, three high speed elevators in each building, base storage, "smart building" high-tech features such as CAT 6 wiring and computer-controlled access monitors, upgraded electrical and command security systems, and a 5.9:1,000 USF parking ratio provided in a combination of service and structured parking stalls. EverWest acquired the asset in March 2017.